To Yelp Or Not To Yelp? Lawsuit Puts The Chill On Bad Reviews : All Tech Considered The next time you are about to post a scathing review of a business on a site like Yelp or Angie's List, you might want to think twice. This week, a housing contractor sued a former customer for $750,000 in defamation charges after she posted a negative review. 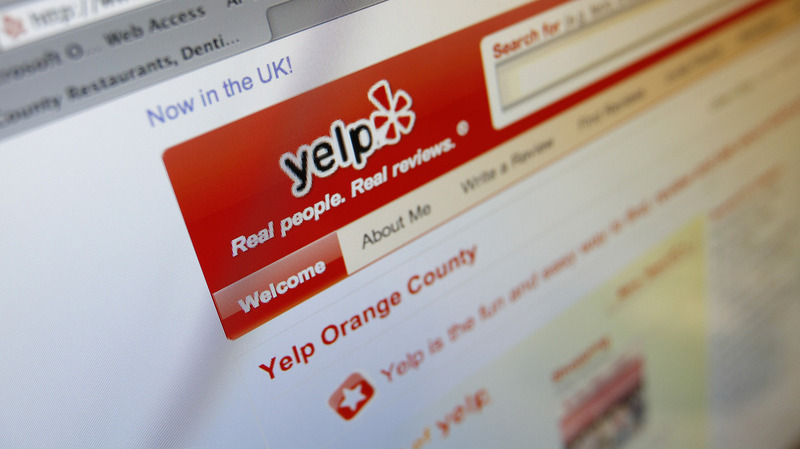 Customer review websites like Yelp have exploded in the last few years, but are negative reviewers at risk of inciting the litigious wrath of angry business owners? The next time you're about to post a scathing review of a business on a site like Yelp or Angie's List, you might want to think twice. This week, a housing contractor named Christopher Dietz sued a former customer for $750,000 in defamation charges for what she wrote in a review on Yelp. Jane Perez wrote that there was damage to her home and that jewelry was missing after she'd had work done from Dietz's company, Dietz Development LLC. On Thursday, a judge took the unusual step of ordering Perez to take down parts of those reviews. While this isn't the first lawsuit of this type, Santa Clara University law professor Eric Goldman tells NPR's Rachel Martin that these cases are, so far, uncommon, because online reviews are still such a new area. "We're still developing the rules about how to deal with consumer reviews," Goldman says. He also says often the economics of litigation don't support lawsuits for a single, negative review. The reality, Goldman says, is that it is extremely unlikely that a single review costs a business anything. "My perspective is that any individual review is not credible, but the aggregate affect of the reviews ... tend to paint a pretty accurate picture," he says. A Harvard study in 2011 showed that a one-star increase on Yelp leads to a 5 to 9 percent increase in revenue. That potential revenue bump gives businesses all the more reason to fiercely protect their online reputation. The lawsuit itself, Goldman says, is a reminder that even though we have the freedom to voice our opinions on the Internet, we also own those words and can be held responsible for them. "Most people don't realize that they're betting their house ... every time they put their opinions out into the public discourse," he says. "When people realize that, it becomes incredibly inhibiting." That appears to be the danger here: Why risk posting a negative review if a business can sue you for it? It's important to note, however, that Perez was sued for specific portions of her review that Dietz considered defamatory, libelous and untrue. In other words, a negative review that's true is, in theory, safe. So, the next time you fire up your Yelp account after a dinner out, just make sure it really was the worst maple-glazed salmon you'd ever had and that fly in your drink was real.